It’s hard to show day by day progress now since I’m not spending all day every day working on these. What I’m trying to do is to sandwich 2 quilts in the morning right after breakfast and then hopefully get to quilting them during the day. I did finish quilting the first 10 these past few days. I’ve not trimmed and bound them yet, but they are going “in a good way”, so I’m happy about that. They make me happy to look at. I do have enough labels made already so once I trim and bind them, I will put on a label, wash, dry, and get pictures of them. After they are photographed I will take them to the church building and get them out of my living room! I am seriously behind on them as my goal is 10 a month. However, because I do have the tops ready to go for the rest of the year, I’m feeling okay about the fact that technically I am behind my own goal of finished quiltsl It IS just my goal and not something I HAVE to do. I know that my showing this, some people think I am superwoman. I am hardly that. I’m not quilting these very densely. 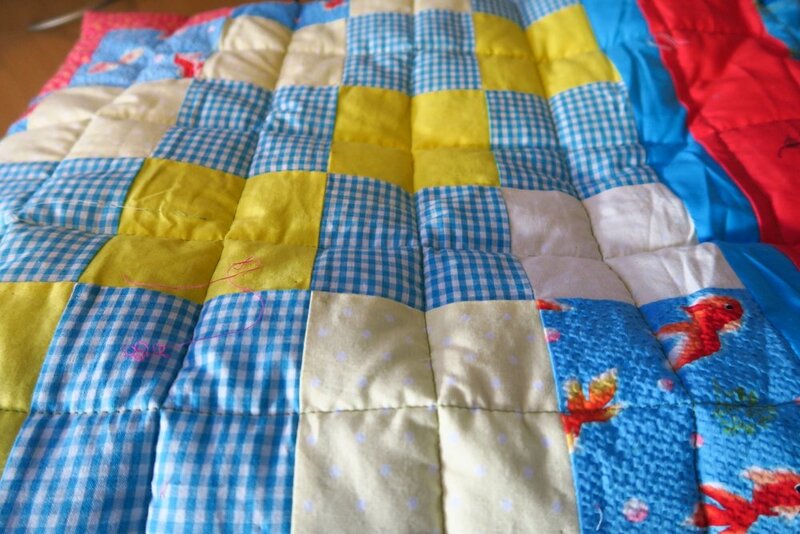 All of the quick strippy ones are quilted along the lines of the strips with straight line quilting, plus a little bit more. They don’t take more than an hour to quilt- if that. The other ones - they vary. My helpers actually complicate the process. 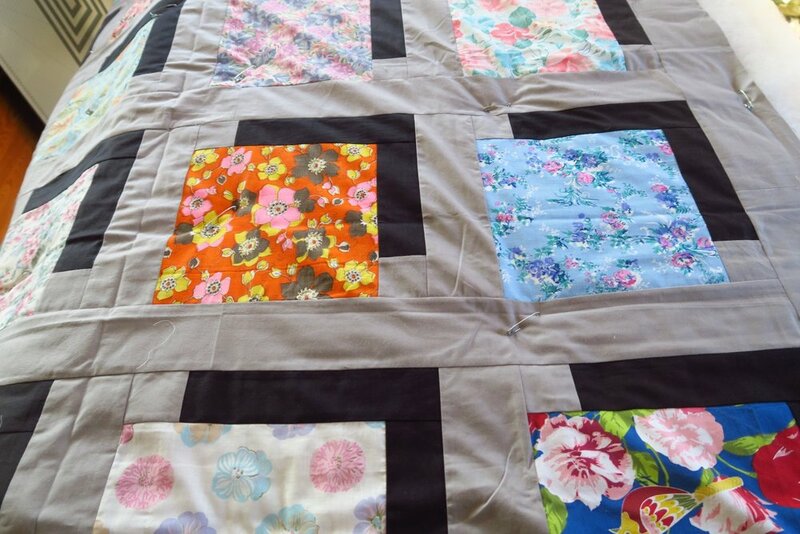 Here are a few close ups of the quilting so you can see what I’m talking about. I’ll be showing each quilt individually after I get it washed and dried. But I am making baby steps on this project and I’m fine with that. My daughter is graduating fro college the first weekend of May so I’m preparing some things to take to the states with me. They are taking priority over this project for now. I think some of you will smile- because I got an email from my friend, Fran today and she said she’s got another box of tops winging its way to me! 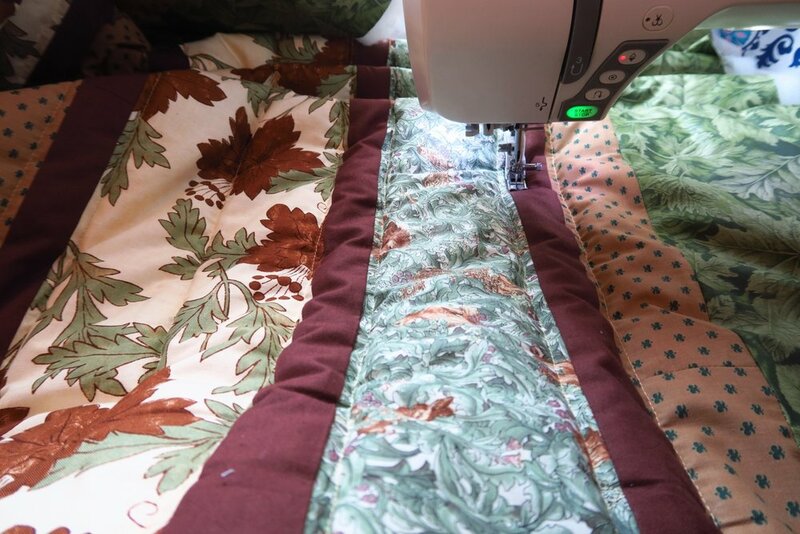 So all this sandwiching and quilting actually does represent more than a single day - probably more like at least 2 days - of work even though I spread it out throughout a longer period of time. And now you know! 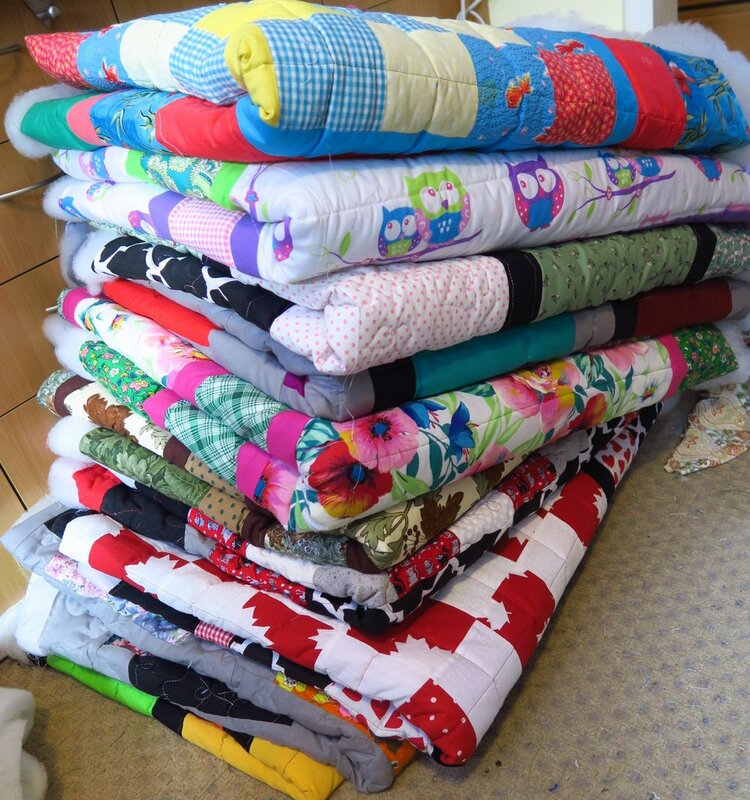 Next time you see pictures of these quilts - they should be trimmed, bound, labeled and washed!